Read below, Success Stories from sufferers who live symptom free through supplements, lifestyle changes and changing their diet. IMPORTANT NOTE: In more recent years the main focus of Meniere's Help has been very much on finding your root cause(s) and dealing with them. Therefore allowing you to overcome Meniere's completely. As you can read in Mike Spencer's most recent book, The Need for Balance, this is backed by medical and scientific studies, data and statistics but most importantly, the real experiences of other sufferers. 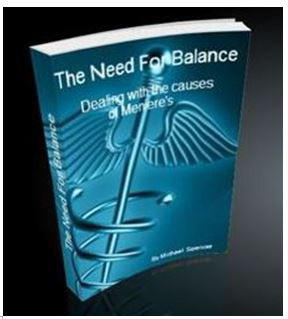 The Need for Balance - Dealing with the Causes of Meniere's can be immediately downloaded for you to start now. Below are stories and messages from people who have been successful in keeping their symptoms at bay and are living a normal life again. In most case they have done this by changing their lifestyle, eating a healthier diet in general and by taking high quality supplements. All of them have taken a specific regimen of supplements, while lifestyle and dietary changes made vary from person to person. In the majority of cases the supplements didn't cure them. They just enabled their body to deal with the inflammation inside their inner ear more efficiently by supporting its immune system with all the nutrients it needs to tackle the oxidative stress and free radicals causing the hydrops (swelling). To read more about the biology of the swelling in the ear and how nutrition is vital in tackling this please go to "What is Meniere's Disease" and about the "supplements" we use to tackle this inflammation. When you understand how and why the inflammation process takes place it is easier to understand how and why quality nutrition helps us. Read a more detailed explanation of the inflammation process here. In most cases, while the supplements enable the immune system to manage the inflammation and the sufferer to stay fit and healthy, it doesn't tackle the underlying root cause. This could be any number of things but the cause can be found in each individual case and tackling that is how you 'cure' yourself. Your symptoms are a result of the inflammation in your inner ear putting pressure on your balance and hearing nerves. The inflammation is a result of whatever your individual underlying cause is. If your endolymphatic hydrops (swelling in the endolymphatic sac) is caused by autoimmune issues or endocrine issues then the correct, quality nutrition and a quality diet may well be the ultimate answer but if it is caused by spinal and neck issues or other musculoskeletal issues then the supplements are stopping the inflammation from becoming chronic but to deal with the cause you would need to identify the cause and correct it. These are just a few of many possible underlying causes. But we do now know the common themes among sufferers. It is just a case of educating yourself and taking appropriate action for your individual case. That is why we are here. To help you with this, so contact us anytime using the email address above. It is a big subject and there are many possible causes but you can find and fix it. It has been done by many and is still being done all the time. We have been seeing this time after time for over 13 years. While the success stories below are mainly based on dietary considerations, click here and here to read more recent success stories from people who have identified and dealt with their cause. Learn more about how you can deal with the cause of your Meniere's here. Never let anyone tell you, "there is nothing more to be done" or "learn to live with it". As you will read from the people below you can learn to live 'without' it. By controlling your symptoms and/or finding and dealing with your root cause(s) you can do this too. I am just writing a quick note to let you know how I am feeling. I have been on the supplements for just over a year and when I compare my lifestyle to this time last year, it is amazing. We are flying off to Australia for Christmas and New Year to celebrate my husband's 60th birthday. Also I have begun to look around for part time work, it is so wonderful to be able to communicate and go to town on my own! "Hope your holiday was filled with love, peace and family. I had a wonderful Christmas. I had e-mailed Debbie telling her that I feel so great lately. My symptoms are totally under control and I feel better than I have in over a year. My ear is so much better! I have been using the supplements since May 2012. "I thought I would provide you with an update of my experiences. Maybe some of my experiences may be helpful for others. It all started with a small feeling of a blocked ear, and the start of a small sound in my ear which was only noticeable when I went to bed at night. I was told I had an ear infection. Anti-biotics didn't change anything and the fullness developed and the sounds in my ear increased. In March I had my first attack, which was horrendous. After this attack, no more followed, but the tinnitus and fullness kept getting stronger. In April I visited an ENT specialist who undertook an audiogram which showed I had moderate hearing loss in one ear. I had an MRI to discount any tumour, which was fine. He told me I had early onset Menieres. I was immediately in denial because I had had no other attacks apart from the first major one, so I thought he was wrong. I left thinking he didn't really know what he was talking about. A couple of weeks later, the attacks started full-on. I was virtually incapacitated for 3 weeks, and it was during this time that thanks to Sue, we found you. In what seems like only that 3-4 week period, the hearing in my affected ear deteriorated very rapidly, and I lost virtually all my hearing in one ear. The ENT specialist was not very helpful. He simply said that I had Menieres, and there was nothing that can be done to help. That's when I started on the supplements. I have always been sceptical about vitamins and minerals, and until recently, even when I was taking them, I remained sceptical. Interestingly, after a very short time of taking the system, my attacks virtually stopped and I began to feel better overall. My tinnitus continued to get worse, and the fullness remained, but no attacks and my head cleared and I was otherwise AOK. I decided that I had to see if the supplements were actually making a difference, or if my symptoms had simply abated as part of the normal Menieres process, so I stopped taking them. Within 10 days of stopping, my symptoms started coming back. Dizziness, spinning etc all started to resume and the feeling of a thick head started to reappear. I was amazed. So I immediately went back on the supplements just 4 days ago, and I am basically back to where I was when I was on them before - no symptoms, clear head etc. The affect is simply amazing. I am no longer a sceptic. I explained to my ENT doctor twice about the nutritional supplement products I was taking, and the beneficial affects I had experienced, and how rapidly I started to deteriorate when I stopped taking them, and then the beneficial affects again when I re-started. He just wasn't interested and virtually dismissive of them. He even suggested that I start reducing them over the next few months to see if they make a difference. Well, I have just done that experiment and I know I will remain on them now. Others that you talk to should not be swayed by an ENT specialist who just doesn't see natural supplements as beneficial. I have, in my mind, uncontroversial proof that for me, they have been of immense benefit. So thank you for your advice and suggestions. So I am now a staunch supporter of these natural supplements. Thank you for your assistance, and I thought you would like to hear my experiences, and also those thoughts of the medical fraternity that are dismissive of the benefits that can be achieved through natural methods. I should also say that during this time I haven't altered my diet at all, and have made no effort to reduce my sodium intake. Despite this, the beneficial affect has been substantial. Hope you are well and look forward to hearing from you again. "I am so sorry I have not been in touch yet! I wanted you to know that I am feeling better and better every day. I have had only one dizzy spell since we talked on July 31st, and that one only lasted 2 hours (they had been averaging 4-6 hours at a time!). What a success! Thank you so much for your ministry to so many people. You are truly an answer to my prayers! Just to let you know that I am continuing with the Vitamins and am feeling fine, better than I have felt in 6 Months I have so much more energy its wonderful. There is a lot of negative press re taking Vitamins in the Press over here at the moment I am feeling so good I am ignoring these reports at the moment. I am doing better with my Meniere's since starting the supplements, not just the vertigo but the brain fog I was in for so long has lifted. I don't feel so awkward while engaging in intellectual conversations anymore. My allergies did better this pollen season as well. 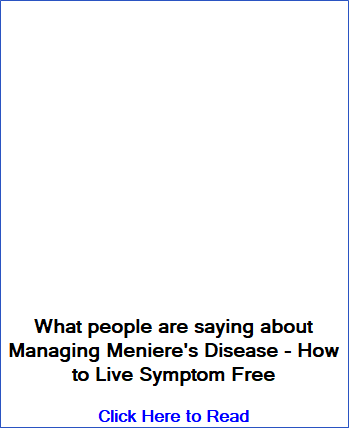 I believe that Meniere's is caused by several scenarios whether allergies, immune deficiency, viruses, etc., but all available remedies were to mask the effects of MM and not help cure the issue. I believe that the supplements have helped me help myself. I had/have one small obstacle to overcome which is over the years I became paranoid that I would have an attack and sometimes that would bring on an attack. I still deal with the feeling of anxiety of having an attack but they never come. In other words, it will take some time to trust that my symptoms are gone forever but I am well on my way to reconciling with this. I am very happy I chose this route instead of the more invasive current practices. I wish I could convince others with this dreaded condition to AT LEAST try it for two months before surgical procedures. By the way, something I did not expect was the fact that I have regained some of my lost hearing. It has been four years since I was able to listen to a telephone conversation in my left ear. I had a conversation with my wife several weeks ago and at the end of the conversation I told my wife I listened to her with my left ear, she could not believe it. I am scheduled for another hearing test and I am excited about the upcoming results. I was not a candidate in the past for a hearing aid, I hope I don't even need one now. It has been quite some time since we communicated and I am so glad to say that it has now been FIFTEEN WEEKS since my last 'attack'. I know you have heard all of this so many times before, but what a difference these supplements have made. My hearing has definitely improved, but still have periods throughout the day when the tinnitus appears louder and the hearing dips. I know I had many problems along the way, but I would think it took approximately six months before I started to feel better. I am gradually regaining my confidence and working up to walking to the local shopping centre on my own. I sometimes experience a slight 'feeling' as if I am about to become dizzy and within seconds this passes. Thank you both for your help and advice along the way and for introducing me to the 'system'.of supplements. I am feeling super after using the supplements. I just realise that a few friends are using the same products. I am happy to take it as long as I need. �Thank you so much. I was spinning for weeks and I am now normal again. I went to your website and after finding the supplements you suggested I took them for two days before almost all my symptoms went away. Thank you. Maybe just put a tab that says THE CURE with the list of supplements. By the way I have been to many doctors and ENT specialist and they have no clue that this works. Without people like you I would still be suffering. You totally rock. I think what you are doing very very important and you helped me get my life back. May your lives be full of joy, Health and Happiness, May God repay you up there for all the people you are helping with meniere's!!! I for one will be praying for you tonight for giving me back my life this year!!! It is one year on the 21 December since I received the supplements and from day two I started feeling better, I could feel that I would get better and spent Christmas day free of an attack, on New Year's Eve I was dancing!!! I really couldn't believe it!!!! THANK YOU!!! I wish the doctors were as helpful and prompt as you are!!! Whenever I have come to you for help, you have been there instantly and that is such a relief! Having your support makes me feel as if I am being looked after and confidence with Meniere's has been fully restored, thanks to your help!!! But you know something? Whenever I tell people with it, they don't believe me!!! I feel so much for these people suffering the way I did but they do not believe!!! Approximately four years ago i was diagnosed with Menieres Disease following many tests and consultations with various specialists. My symptoms became very severe with the hearing in my left ear being virtually destroyed. On top of this i had sustained periods of extremely high levels of tinnitus in both ears and sporadic hearing loss in my right ear which could last for up to a month at a time. Oh yes and of course to top all of this off i had lots of vertigo attacks for these sustained periods. Most of which would leave me vomiting and bed ridden. Naturally this effected every element of my life and work became almost an impossibility as i work in a hectic office that requires a lot of interaction with customers and staff. Gradually this effected my confidence and i contemplated leaving my job. During this time i saw yet more specialists and tried all of the recommended conventional treatments for menieres such as SERC, Steroids Diuretics etc etc. All to no avail, i was determined not to go down the surgery route as all of the information that i read about it had led me to the conclusion that it is maximum risk for minimum gain and my specialist said that it would only incur deafness in my good ear. To cut a long story short after trying all kinds of alternative medicines too acupuncture, Raiki etc I was at a loss and i joined SPIN the British Charity for Menieres sufferers. All if the information in their helpbooks was fairly negative and there appeared to be no way out of this nightmare and to make matters worse i was off work unable to attend due to the severity of the symptoms. At this point i would of literally tried anything when i came across the system information. At first i was very sceptical yet i was intrigued by others testimonials that mirrored my own symptoms and problems. The research and reasoning behind the supplements appeared to make more sense than just being told by doctors to "keep taking the tablets" I had no idea why i was taking them and they just seemed to aggravate the situation and not help me in any way. So i went for it as Karins and Michael's confidence in them was extremely high. On receipt of the first batch i was probably at my lowest ebb that i have ever been at in my whole life hence my willingness to try anything. I followed the guidelines as to how to start taking the supplements and building up my immune system properly and within one week i had a massive remission of the deafness in my right ear and all vertigo with a drastic reduction of tinnitus in both ears. I have continued to take the supplements twice daily ever since and can honestly say that i have led a completely normal life since and have returned to work with renewed fervour and energy. If anyone is still unconvinced by this then i would me more than willing to talk to people who would like any guidance or help as i would like to try and help in the way that Michael has helped me. "Had to cry when you sent me the story on Terry. Please keep me informed on how he does. I sent him an e-mail to tell him what wonders that the system David is using has done for me. I encouraged him to stick with the supplements and not give up. I am just so thrilled over the supplements. They have changed my life. I have had no vertigo or drop attacks for two months now. I am so amazed that I would like to see other people give them a try to get a new lease on life as I have. I feel like a new person!!! "Long time no hear. Just like to give you an update . brain fog almost gone, as is dizziness and that overall bad feeling. but I can put up with that. I also think its helping with my diabetes. I cut my insulin from 30 to 25 units, I think that's great. "I just wanted to update you on my father. He is doing so much better. He had been suffering from Meniere's Disease episodes for 5 months with relative brief periods of cessation. He is 87y.o. He also has severe COPD and heart disease, although up until the Meniere's Disease symptoms, he had been relatively independent . The Meniere's Disease episodes were debilitating and depressing. We followed the doctor's protocol.. low salt diet, diuretics.. nothing was working. I was beginning to think it was going to kill him. 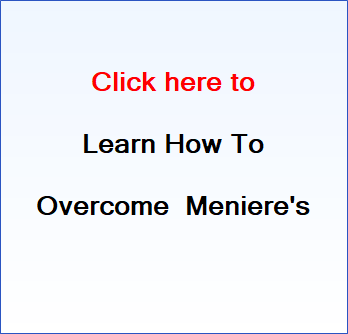 We had heard from a couple of sources that there was a positive link between Meniere's Disease symptoms and antioxidant therapy, we decided to give it a try. This source had recommended different supplements. We followed their recommended dosages. The symptoms subsided for a couple of weeks, and then returned full force. I continued to do research on the Internet, and you.. My father has not had a full-blown episode of Meniere's Disease in 6 months. He also seems to have increased energy. He is back doing yard work and minding everyone's business! I'm so glad to have my father back. I felt obligated to write this letter. If anyone out there is suffering from this potentially debilitating disease, don't give up hope., please feel free to post this on your web page. "My name is Debbie, I am 45 years old and I have dealt with the horrible disabling disease called Meniere's Disease since November of 1997. I started out with ringing in my left ear about six months prior to having symptoms of the Meniere's Disease itself. I went to three Dr's when I developed the ringing because it was so loud that it interfered with my daily living. I even had a hard time sleeping at night. The Dr's told me that I had tinnitus and there was nothing that could be done for it. I was told I would have to just learn to live with it. Finally, in November of 1998, I was working and started developing some dizziness every time I bent over or moved my head too fast from one side to the other or up and down. I worked at this job for about nine years. I was a home health aide and my job required a lot of traveling. I was out of town the day that the dizziness started. I noticed at a patient's home while I was doing some dressing changes that every time I bent or moved my head I got dizzy. I had never been dizzy before in my life and it really concerned me. I left the patient's home and had about an hour's drive before I got back to the office where I worked. I noticed that the whole time that I was driving in that I could not focus on anything or move my head very fast or I would get dizzy. It was about three in the afternoon and I just thought that maybe I was dizzy because I hadn't eaten anything all day because I had been so busy that day and running behind. I finally made it back to the office and they had a big dinner that day where everyone brought in pot luck for Thanksgiving. I got out of my car and was thinking that I would go in and eat something before I did my paper work for the day to see if it would get rid of the dizziness. As I was walking from the car towards the office door, I noticed that I felt an imbalance and couldn't walk a straight line. I was really beginning to get scared. When I got to the door and walked in, there was a friend of mine sitting at her desk and had been watching me walk towards the building. She asked me if I had been nipping the bottle and laughed at me. She thought that I was just putting on an act and being silly. I told her that there was something wrong with me and explained to her what was happening with me. She asked me if I felt sick at my stomach. I told her no. I then tried to hurry back and get something to eat. I ate gobs and gobs of food hoping that it would take care of the dizziness. After stuffing myself, I went back out to my car to get my paperwork and get it done so I could go home. The dizziness kept getting worse. As I got back to the door again, I couldn't even focus on the handle to open the door and instead of walking up the sidewalk I was wandering around on the grass. I managed to get the door opened and my friend, which is an R.N. meet me at the door this time and told me to stop it because I was starting to scare her. I told her that I wasn't fooling around and that something was really wrong. By this time she knew I was serious and asked me again if I felt sick at my stomach. I told her no and then tried to show her by turning my head when I felt the most dizzy. The next thing I knew is that they were carrying me back to the bathroom and holding my head up over the toilet so I could throw up. My whole world starting spinning out of control and I couldn't even hold my own head up over the stool to vomit. The boss, which is an R.N. also came in and picked me up and carried me to his truck and took me to a Dr's office there in town. The whole trip there he was holding me up with one hand and driving with the other. I couldn't sit up on my own. By that time I had tossed everything that I had eaten and had dry heaves so bad that I thought I was going to die. I laid on the table at the Dr's office for about three hours before the spinning stopped. The Dr. told me that I had an inner ear infection and gave some antibiotics along with meclizine for the nausea and sent me home. My daughter came and got me from the Dr's office. I was totally drained for about three days after the first attack. I noticed that my ear felt like someone had filled it full of water and put a plug in it and the ringing got ten times worse as if it wasn't bad enough to start with. I finally went back to work after taking off for four days. About a week and a half later after getting off work I was standing in the laundry room folding my clothes and my daughter happened to be here. I noticed that I was beginning to feel a little funny and my ear started ringing out of control. All of a sudden my world started spinning again and I fell to the floor. My daughter wanted to call the ambulance but I refused and told her to just get me something to throw up in and please leave me alone. I laid on the floor for about two hours this time heaving my insides out before this attack left and I was able to get up and walk to the bed. After the second attack, I really began to get concerned. Then one day I got out of bed and started off to work again as usual. I had put the drop attack nightmare behind me. All of a sudden my world started spinning out of control again and I fell to the floor again. This time it lasted for over four hours. I heaved so much that my whole body hurt. I called the Dr. back and told him the next day what had happened and he told me to give it a little more time. The vertigo and drop attacks came back full force over the next several weeks, only ten times worse than they were before the surgery. My life was in an uproar again and my nightmare had returned. I then went back to the Dr. and he said that scar tissue had grown over the tube and that was why it stopped working. He then started me on Gentamycin injections to kill out the balance nerve in my inner ear. This was a nightmare in itself. When the nerve is killed out then the other side of your brain has to learn how to work without using the other and the imbalance is horrible. I had three injections into the inner ear and still having the attacks and vertigo. He told me that it may take as many as seven injections before the nerve was completely destroyed. He had to give the injections in very small doses to keep from destroying any more hearing that I had left. I had to take one injection then wait for several weeks to see how it worked. If there was no success then I had to go back for another one. I finally gave up after the third injection. I would schedule an appointment but end up canceling it before the visit. I did this several times. I felt as if my life wasn't worth living anymore and that nothing was going to help. I then happened to be looking in a site on the internet one evening on Meniere's after getting my strength back after having a bad vertigo and drop attack. I ran across a story about someone that also had Meniere's and was looking for help also. She had mentioned a site that she had found on someone selling natural supplements but didn't have the money to invest into it and was wondering if anyone had any information for her to help with her Meniere's. She just happened to give the e-mail address of the site that was selling the supplements. I decided to check into it but had no intention of buying natural supplements. I had taken Valium, Prednisone, Meclizine, diuretics and many more with no help. I was very skeptical and really didn't want to try them and knew that they probably wouldn't work but thought that I couldn't lose anything if I could get my money back. I started on the the products in December of 2001 and have taken them faithfully since. The first few weeks of taking the supplements, I felt kind of like I had the flu and wanted to quit. Didn't seem like the dizzy spells or vertigo was getting any better. After being on the products for about four weeks I noticed that my dizzy spells were gone and the vertigo had stopped. I have not had one dizzy spell since the second week in January of 2002. I would encourage anyone out there with Meniere's Disease to try this product. I have my life back and have more energy than I have had since I was a teen-ager. I won't go one day without the supplements. I still can't believe that I went through all the surgery and treatments when all I needed was something natural that my body was lacking and being deprived of. I still have a little ringing and the hearing will not come back. The ringing has even went down to where I can live with it now. I can even at times not even notice that it is there at all. These products are amazing. Anyone out there that is living with this horrible disabling disease, PLEASE give this product a chance!!! !